Yesterday I had the opportunity to visit Mavorâ€™s in Downtown Charlottetown. Mavors is a small unique restaurant within the Confederation Centre of the Arts. Today, a cook from another restaurant and I decided to head out to grab some burger lovinâ€™s. 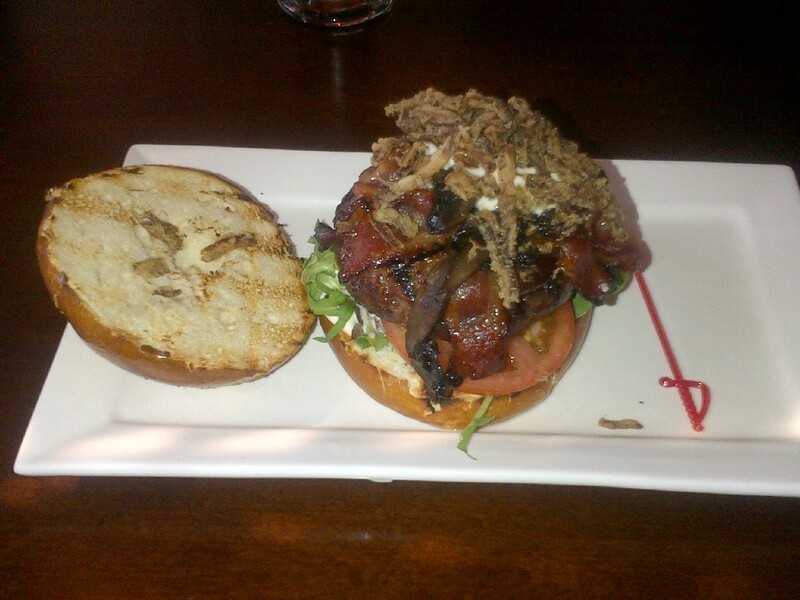 I was excited to try Mavorâ€™s as I had heard multiple comments about the restaurant and others burger love experience. So we had the opportunity to head on over and grab what is known as their M-1. Shortly after arrival, we were greeted by our waitress, Brittany. After a little to do about where to sit, we were properly seated at a clean table. Then, our server asked us as to what we were having and for us there wasnâ€™t much question as to what we were having for us! The M-1 was that much closer. While waiting, the decor plays an important role and the decor of Mavors is wonderful. They went through a make over in the past year and it looks great plus the sunlight during the day plays a nice role when you are sitting next to the window. A short time later, out came our server, Brittany, and our M-1â€™s. After a few attempts at taking a photograph comparing the burger to the size of my mouth, we became impatient and dug in! The first bite of this humongous burger and you know itâ€™s delicious. It doesnâ€™t take more than a bite for confirmation that this burger is one of the most delicious burgers out of the PEI Burger Love menu. Not only was the burger juicy and flavorful, but it was grilled to perfection. The horseradish aioli and candied bacon definitely added flavour to this burger to really drive home the messaging. On a scale of 0-10, I would give this burger 9.5 bites. 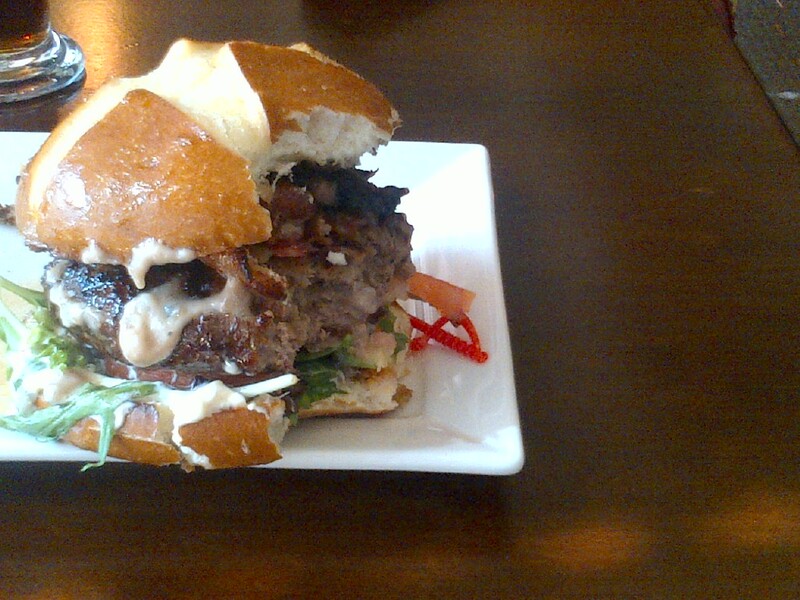 It was equally delicious as Gahan Houseâ€™s burger and was very easy to finish. It didnâ€™t leave me with the too full I gotta sleep feeling (the too full coma), but full for hours upon end as the toppings were of the lighter variety which helped. Seven hours later and I am still pretty good about the burger. All in all, the service was great, the food was great and it was a very enjoyable meal for around $15. After finishing up my burger, I then headed on over to Dynamic Fitness who will be helping me insure I donâ€™t gain the amount of cow I will be eating by the end of PEI Burger Love. Thanks to the staff there, they have me on a program which will no doubt fight off my extra calorie intake.